My Station Causes RFI – What do I do? All RFI problems have a SOURCE, a PATH, and a VICTIM. You have to identify the source, choke off the path, and protect the victim. In most cases of ham radio operation or commercial broadcast, the transmitter is the source, the path is the “receiving” antenna disguised as the AC wiring, phone lines, cable/satellite feeds of the VICTIM, and the VICTIM are electronic devices that amplify the received signal and create the disturbance in the form of sounds, buzzes, non-operation or scrambled video images. Our RFI solutions use ferrite RFI suppressors in a variety of forms, mixes (which determine the range of suppressed frequencies), and combination kits to solve common specific problems caused to victim devices. You should first cleanup the source, identify and choke the path and then protect the victim. It is quite common to have multiple paths to a victim electronic device and ALL paths must be choked, otherwise some RFI may continue to exist. If you have multiple coax fed antennas, ALL antennas should have a balun at the coax/antenna feed point to keep RF off the outside braid of the coax and prevent it from radiating. Like wise all control cables (rotor, antenna bias T or adjustable antenna control wires) will also need to have RF suppressors at the antenna feed point. Choose the solutions below to solve your RFI problem. Individual Ferrites – Toroids, Slip On, Snap On – for 1/8″ wire to 3″ cables. My Station is a VICTIM of RFI – What do I do? 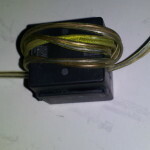 RFI to ham radio receivers can also be caused by broadband hash or “birdies” from computers, routers, DSL/cable modems, fish tank heaters, plasma flat screen TV’s, heating oil pump control circuits, solar controllers, switching power supplies, battery chargers, and other low power “transmitters” coupling their RFI into your AC power line, speaker cables and RF cables. Common mode noise can be picked up from antennas not using baluns at the radio end as the outside of the braid acts as a part of the antenna and antenna current is induced from the offending source (which may be your own antenna radiation) and from the feed line current that is “unchoked” at the antenna feed point. To remedy the interference, you need to identify the SOURCE, choke the PATH, and protect the VICTIM. Choose from the solutions below to reduce common mode RFI and “noise” from your radio station. Determine the primary interfering frequency of the source and select a ferrite mix that is effective at the interfering frequency. Select a ferrite form (Snap On, Slip On, or toroid (Donut shape) with a diameter that will allow one or more turns thru the center. Remember that the choking impedance increases with the SQUARE of the number of turns. If 1 turn = x, 2 turns = 4X, 3 turns = 9X, etc. Choose a larger center hole to get more turns of the conductor. A higher impedance is desired as it suppresses the common mode current more (E=I/Z). Choke ALL input cables into the radio room. This means, all AC cables, all phone lines, all computer cables. 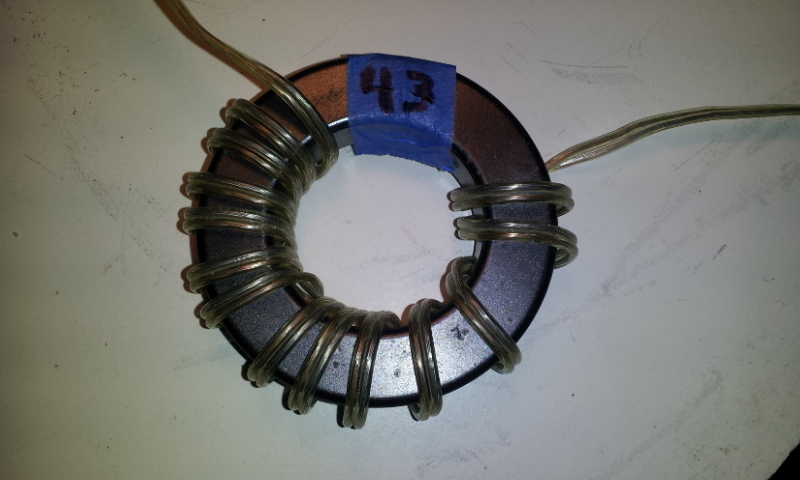 Usually a 2.4″ toroid of mix 31 with multiple turns will suppress common mode currents in the 1-31 mhz range. 6-12 turns of the AC cable (with plug) will generally suffice. Apply same remedy to CAT5 cables, DSL/Satellite cables, rotor control lines, antenna control lines, and coax feed lines, etc. 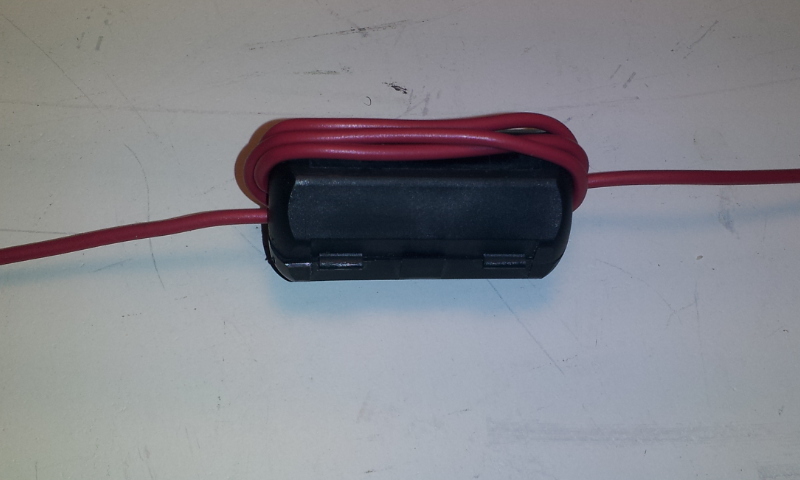 Each coax feed line should have a choke over 500 ohms at the radio end. 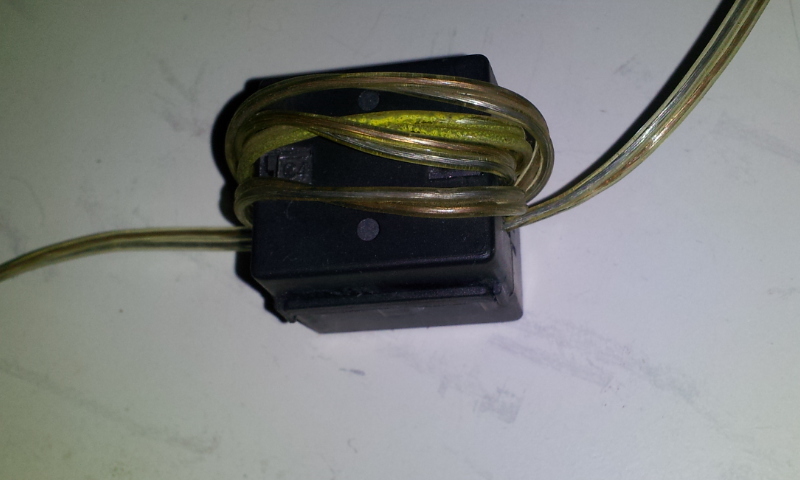 See common mode chokes/line isolators for product selections. In difficult cases, a line isolator may be required every 1/2 electrical wavelength along a coax feed line (measured from the antenna feed point). Within the station ensure a common RF ground for all equipment and use a 2.4″ toroid on all AC and DC power lines into your equipment. 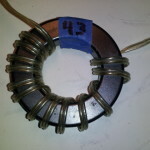 Use at least 5 snap ons (FSB-1/2) if not using multiple turns on a 2.4″ toroid. Toroids are also available with diameters up to 3″ for larger cable bundles. If your RFI problem is on the low frequencies like 160-80-40 meters, than more than likely, RF is getting into your AC lines and the chokes mentioned above will help suppress the problem. If the RFI is at higher frequencies, look for shorter antennas like interconnect cables between equipment which act as antennas and use FSB-1/4 or use FSB-1/2 with multiple turns to suppress the interference. Choose from the products below depending on the form factor needed. 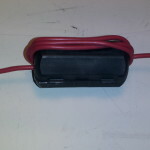 Individual Ferrites – Toroids, Slip On, Snap On – for 1/8″ wire to 3″ cables available in convenient 10, 25 and 100 packs. Got a tough RFI problem and need technical help? Email Sales@Palomar-Engineers.com for advice on the Palomar products to use. floor dropped to below 1 S unit ( not readable on my TS-480s).